And not wanting what you don’t have. — Shakyamuni Buddha, 500 B.C. To do, someone to love, and something to hope for. I think a lot about happiness – what makes a person happy, whether or not happiness should even be a life’s priority – things like that. A good high school friend stunned me at the early age of 17 by suggesting we should not necessarily try to be happy. Sacrifice, service, devotion to a cause were higher orders, he felt, although presumably, since those were choices, their pursuit could secondarily lead to happiness. Through the years I’ve accumulated a short list of quotes that express a personal view of what makes people happy. You, I’m sure, have your own candidates, but most of them probably resemble some of the ones listed above: Stay busy doing something you enjoy; be mindful of other people and the world in, around, and above you; don’t let your reach exceed your grasp; find someone to share your happiness with. My favorite of all of these is the one above by Donovan – that somewhat kooky “love generation” folk singer of the late 1960s. “Happiness runs in a circular motion…happiness runs, happiness runs.” There may be more to this refrain, however, than appears at first glance, the entirety of which I’ve tried to encapsulate artistically in my open-ended smiley face that wasn’t ever-popular when Donovan crooned the tune. For years I thought that the gist of Donovan’s phrase was the obvious – the “pay it forward” allusion that suggests what goes around, comes around – and it undoubtedly is. But there are hidden nuances, at least to me. The “running in a circular motion” also connotes a self-contained, inward-looking, self-satisfaction that equates happiness to being content with yourself as a person. And the last phrase – “happiness runs, happiness runs” may speak to the Buddhist philosophy of impermanence and the priority of the moment. Donovan might not rank up there with Kant and Spinoza, but his little song packs a powerful message. Rock on, flower child, wherever you are. For years I thought that the gist of Donovan’s phrase was the obvious – the “pay it forward” allusion that suggests what goes around, comes around – and it undoubtedly is. But there are hidden nuances, at least to me. And while happiness may run in a circular motion, it seems history may too – or at least it may rhyme, as Mark Twain once said. Pictured below are two of my notes written not recently, but in 2003. They are as relevant today as they were then. “Financial repression” runs…in a circular motion, it seems. In 2003, though, central bankers had rarely contemplated the monetary policy instruments that could lower and then artificially cap interest rates. Although my notes correctly allude to “all means including ‘ceilings’ ” to keep the cost of financing low, the expansion of central bank balance sheets from perhaps $2 trillion in 2003 to a now gargantuan $12 trillion at the end of 2016 is remarkable. Not only did central banks buy $10trillion of bonds, but they lowered policy rates to near 0% and in some cases, negative yields. All of this took place to save our “finance-based economy” and to raise asset prices upon which that model depends. As any investor would admit, these now ongoing policy panaceas have done just that – promoted higher asset prices and engendered a modicum of real growth. In the process however, as I have frequently written, capitalism has been distorted: savings/investment has been discouraged by yields/returns too low to replicate historic productivity gains; zombie corporations have been kept alive in contrast to Schumpeter’s “creative destruction”; debt has continued to rise relative to GDP; the financial system has not been cleansed and restored to a balance where risk and reward are on a level plane; disequilibrium has replaced equilibrium, although it is difficult to recognize this economic phantom as long as volatility is contained. But in order to control volatility, and keep a floor under asset prices, central bankers may be trapped in a QE-forever cycle, (in order to keep the global system functioning). Withdrawal of stimulus, as has happened with the Fed in the past few years, seemingly must be replaced by an increased flow of asset purchases (bonds and stocks) from other central banks, as shown in Chart I. A client asked me recently when the Fed or other central banks would ever be able to sell their assets back into the market. My answer was “NEVER”. 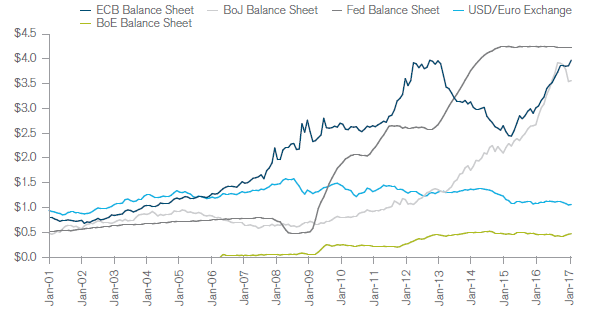 A $12 trillion global central bank balance sheet is PERMANENT – and growing at over $1 trillion a year, thanks to the ECB and the BOJ. An investor must know that it is this money that now keeps the system functioning. Without it, even 0% policy rates are like methadone – cancelling the craving but not overcoming the addiction. The relevant point of all this for today’s financial markets? A 2.45%, 10-year U.S.Treasury rests at 2.45% because the ECB and BOJ are buying $150 billion a month of their own bonds and much of that money then flows from 10 basis points JGB’s and 45 basis point Bunds into 2.45% U.S. Treasuries. Without that financial methadone, both bond and stock markets worldwide would sink and produce a tantrum of significant proportions. I would venture a guess that without QE from the ECB and BOJ that 10-year U.S. Treasuries would rather quickly rise to 3.5% and the U.S. economy would sink into recession. An investor must know that it is this money that now keeps the system functioning. Without it, even 0% policy rates are like methadone – cancelling the craving but not overcoming the addiction. So what’s wrong with financial methadone? What’s wrong with a continuing program of QE’s or even a rejuvenated U.S. QE if needed? Well conceptually at first blush, not much. The interest earned on the $12 trillion is already being flushed from central banks back to government fiscal authorities. One hand is paying the other. But the transfer in essence means that monetary and fiscal policies have joined hands and that the government, not the private sector, is financing its own spending. At an expanding margin, this allows the private sector to finance its own spending and fails to discriminate between risk and reward. $600 billion in the U.S. for instance goes into the repurchase of company stock, whereas before, investment in the real economy might have been a more lucrative choice. In addition, individual savers, pension funds, and insurance companies are now robbed of the ability to earn rates of return necessary to maintain long-term solvency. Financial Armageddon is postponed as consumption is brought forward and savings suppressed and deferred. For now, investors must go with, indeed embrace this financial methadone QE fix. Quantitative easing will continue even though the dose may be reduced in future years. But while a methadone habit is far better than a heroin fix, it has created and will continue to create an unhealthy capitalistic equilibrium that one day must be reckoned with. Yields will likely gradually rise (watch 2.60% on the 10-year Treasury), yet they will stay artificially low due to the kindness of foreign central bank quantitative easing policies. But that is not a good thing. Happiness runs…Happiness runs, and so one day, will asset markets, artificially supported by quantitative easing.